After gathering link building prospects with this tool, it's easy to identify low-hanging fruit and natural opportunities to build links to your site. After you finish configuring the tool, your Link Building campaign will begin. Keep in mind it may take a couple of minutes for SEMrush to pull all the data. You’ll be given 4 tabs to manage a workflow of your campaign - Overview, Prospects, In Progress, and Monitor. In the Overview report, the tool will break down your campaign’s overall size and progress. From here you’ll be able to see how many prospects are in your campaign, how many you have to reach out to, how many replies you’ve gotten, and how many domains you’re monitoring. You can also connect your Google Search Console and Gmail accounts to the tool to strengthen the accuracy of SEMrush’s suggestions and allow you to reach out via email without leaving SEMrush.com. In the Prospects report, the Link Building Tool will break down all of the gathered opportunities by their respective sources. These include prospects based on Organic Search (the keywords you entered), Competitors backlinks (the competitors entered), Mentions, Manually uploaded links, Lost (gathered from the Backlink Audit Tool) and any Rejected backlinks. You can filter your potential backlinks by URL type, keyword, or TLD so you can see specifically what type of links you are going after. These different URL types include forums, blogs, news, review, wiki, and general. Knowing these different URL types can let you target specific types of sites that are more targeted towards your audience. After applying filters, you can bulk-reject prospects to remove large groups of unwanted prospects. You can inspect each opportunity by expanding the preview and choose to move forward with it by adding the prospect to your “In Progress” report using the green button. To reject any prospects, you simply need to hit the X under the Actions column. You can advance multiple prospects to an outreach strategy in bulk with the checkboxes and “Add with” button, and you are able to delete prospects in bulk with the “reject” button. These two features are located in the top left of your listed prospects and will speed up the process of combing through prospects and reaching out. Each link in the list can be expanded to see further details by clicking on the drop-down arrow in the Rating column. When expanded, you will be able to see the domain quality of this backlink, as well as the domain relevance and domain health. “Source of prospect” at the bottom of the drop-down will explain how SEMrush found the opportunity (based on your keywords, competitors, or other). Toxic Rank is a metric calculated by SEMrush that estimates the possibility of a link from the suggested prospect being harmful to your website, as the result of appearing spammy or fake. Each of these bits of information will help you determine if the opportunity would be beneficial to your backlink profile. To see what each prospect looks like, you can open the link in a new tab using the blue pop out icon next to the URL or click right on the link to open a preview within SEMrush. This makes it easy to judge whether or not the prospect seems like a good fit. When moving a backlink into the In Progress section you will be asked to select the outreach strategy in which you want to sort your links. This is simply the method by which you plan to acquire said link. Among these different types are General, Manual Link, Directory/Catalogue, Add Link to Article, Product Review, Link from Mention, Guest Post and Recover Lost Backlinks. If you want, you can customize your task types and add a new category to customize your workflow based on how you plan to build your links. 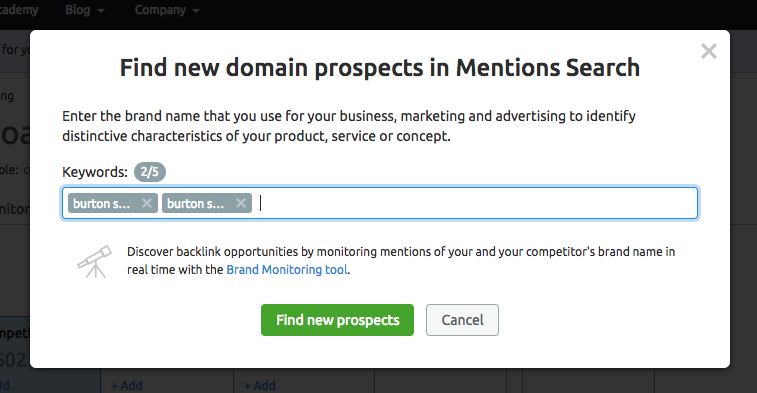 You can add additional prospects by clicking on the +Add button located below the Organic Search, Competitors, Mentions and Manual Upload sections. When you choose to add by Organic Search, you’ll be given the choice to add advanced search operators to your keywords. These operators give you even more flexibility to specify your search and find the exact prospects you need. To add ideas from Mentions, you can enter up to 5 keywords that represent your brand name being mentioned by another website or blog on the Internet. You can quickly gather new prospects by clicking on the blue “update prospects” button in the top right, directly next to the export tab. This will allow you to update your prospects based on your current campaign settings. Or, you can restart the tool to get rid of all of the prospects in your table and start afresh link building campaign with all new settings. URL Type gives insight into the type of website the opportunity is - whether its a blog, news site, review site or forum, your outreach strategy may change. Domain Score and Trust Score measure the quality of a domain based on its referring domains. As for the rating of the backlink, this is based on over 50 factors and is rated based on the link’s quality and accessibility. The more quality a link brings to your overall profile and how easy it is to access will encourage a higher ranking, with 5 being the highest. The higher the rating, the more likely you’ll be able to add the link to your backlink profile. Once you have decided which links you are going to want to add, you’ll want to head to the next step of your workflow: Reaching Out to Potential Backlink Partners.